Add some colorful fun to your parties, gatherings, or corporate events with Party Zone balloons and put a smile on everyone's faces! Let's be honest, no party is complete without those fun, colorful, bouncy balloons we all know and love. Which is why you want the best balloons for your parties, themed events, showers, or ceremonies. Party Zone balloons offer a high-quality, durable latex that's durable, stretchable, and can be used with helium or air. Better yet, they're made with vibrant colors and fun graphics that make the perfect touch for just about any party that you've got planned. Use them for bachelor parties, gender reveals, birthdays, baby showers, wedding centerpieces, and so much more! Inflation Note:Balloons filled with helium will last approximately 8-14 hours, while those with air will stay filled for up to 5-7 days. Get these beautifully colored latex balloons for your next birthday party, baby shower, or exciting event today by clicking 'Add to Cart' above now. Premium Party Balloons - Crafted with a strong, durable latex, our colored balloons make the perfect addition to birthdays, graduations, baby showers, and events. Bright, Vibrant Color Choices - Party Zone balloons come in a variety of gorgeous colors that can be matched to your centerpieces, décor, or party style. 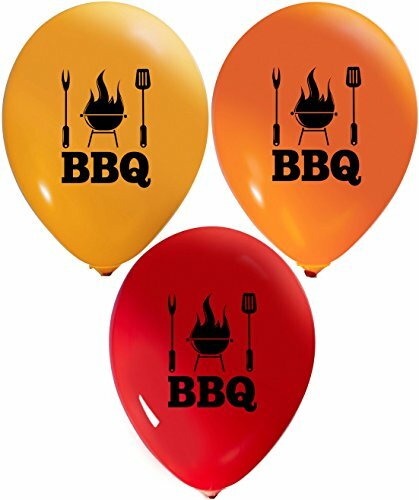 Fun Printed Graphic - The "side" of each large 12" balloon features an exclusive graphic that kids and adults will love. Choose one that matches your party's look! Bouncy, Kid-Friendly Fun - Simply fill this with your breath or helium to expand their round, floaty surface. Air can last 5-7 days, while helium lasts 8-14 hours. If you have any questions about this product by Party Zone, contact us by completing and submitting the form below. If you are looking for a specif part number, please include it with your message.